Just a quick post on this, but one I thought may prove useful for some. When you’ve plastered your whole house, the next costly activity (wow, they come thick and fast) is painting it all, and it tends to be something you don’t really think about when budgeting (or we didn’t, maybe we were naive). Obviously there are some cheap options on the market, like this B&Q Matt Emulsion coming in at £0.99 per litre. However, it is so important you don’t just look at price – you can waste money and time with a cheap paint like this, just read the reviews! Anyway, the point of this post is mainly to recommend a great eBay find we came across that has worked wonders for us. Buying a pallet of Leyland Trade Contract Matt Emulsion (12 tubs/120 litres) has worked out great value and it has been brilliant for everything, including watering down for a mist coat. Buying in this quantity means it only works out a little more than B&Q’s own brand at £1.25 per litre (FYI the Valspar equivalent comes at £2.54 per litre!) and is incomparable in quality. 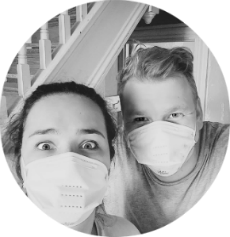 The whole gutting and stripping process is into it’s 9th week (see before pics here), what with us both trying to fit any work on the house in around our other full-time jobs. A theme you’ll notice is the slow waning of the smiles in pictures and the pain setting into our eyes as blisters appear on hands and more clothes are added to the “DIY” pile. But don’t let that put you off. We’re lucky enough not to have to move in straight away, so can completely gut the house whilst the work is done thanks to the lease on our London flat only running out next week and the generosity of my parents. Stage one was to remove any furniture left by the previous owner, fixed or otherwise (not the primrose bathroom suite, I hear you cry). Out comes the kitchen, with Greg looking very proud at his plumbing handy work (?). Pay attention because I’m about to give you the best advice you’ll ever receive. Never wallpaper anything. Ever. You’ll have to take it off at some stage. Let that be a renovation motto to live by (until I find a beautiful print paper and my own advice flies out of the window, I’m sure). Join our mailing list and stay up-to-date with all the latest developments on A House to Call Home. Still a work in progress 🛠 but looking at how far we've come is always the biggest motivation to keep going ⏩💪🏼 . . You know you're renovating when you've got the actual frames up but still have the stock images in because that's number 4378 on the list, just below putting actual usable door handles on.